Anthropological linguistics, syntax, phonology, foreign language teaching. Affiliated Faculty, Department of East Asian Languages and Literatures and Director of GW Language Center. 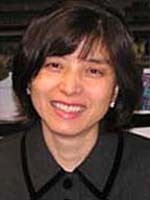 Dr. Hamano is a linguist specializing in the Japanese language and in language pedagogy. Dr. Hamano is engaged in an online Japanese grammar project. Her recent research has been on northern dialects of Japanese. To see Dr. Hamano's CV, click here. 2012 Tsujioka, T. and S. Hamano. Intermediate Japanese: Grammar and Workbook. London and New York: Routledge. 2010 Hamano, S. and T. Tsujioka. Basic Japanese: Grammar and Workbook. London and New York: Routledge. 2002 Cipris, Z., and S. Hamano. Making Sense of Japanese Grammar: A Clear Guide through Common Problems. Honolulu: University of Hawaii Press. 1998 Hamano, S. The Sound-Symbolic System of Japanese. Studies in Japanese Linguistics, vol. 10. Stanford: Center for the Study of Language and Information. n.d. Hamano, S. Visualizing Japanese Grammar — Available here. 2008 Hamano, S. "Sound symbolism in northern dialects of Japanese: Its implications for historical linguistics." In B. Frellesvig, ed., Current Issues in the History and Structure of Japanese, p. 171-185. Tokyo: Kuroshio. 2007 Hamano, S., and S. Dubinsky. "A window into the syntax of control: Event opacity in Japanese and English." University of Maryland Working Papers in Linguistics, no. 15. College Park, MD: University of Maryland Dept. of Linguistics.